Okay, so you may be thinking “why would I want to save money when I’m no longer in this world?” Well, these will preparation tips aren’t really to help YOU save money. Rather, they’ll help your family avoid tons of headaches. 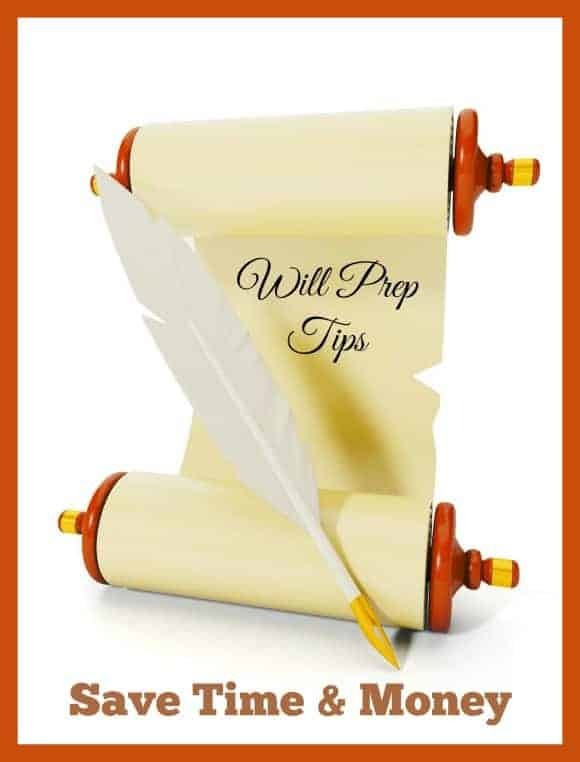 Whether you are using an online will service, a lawyer or going to a notary you need some will preparation tips! Believe me and trust my experience: my husband and I decided that we needed a will. We booked an appointment with our legal representative. It was one of my least favorite appointments. Who wants to discuss death and decide who gets what, or talk about what happens if you get ill? She asked us lots and lots of questions: some of them we could not answer right away, some of them we were able to answer! Fortunately, the representative had great experience in the matter and gave us enough time to think about everything. Here is what I learned from this appointment that will save money when preparing your will. Do you know of any other tips to help draft a will and save money for your family down the road? When you are in your 20s, you don’t think much about death. You are too busy studying, starting your job, building your career. In your early 30s, you have probably started a family, so you are running behind everything. In your late 30s, you start thinking about retirement, death, etc! Not funny but as adults we need some financial preparation for death or an incapacity. How is family going to pay for funeral? If children are too young, who takes the custody? I know, I know it’s too heartbreaking! The first step to preparing for your inevitable demise is a will and it requires some preparations. You don’t need a list of all your assets to write down on the will. I was prepared to write down all this for the legal representative but she said: the assets evolve during a life time. What you need to do is have a folder with all the legal documents at home (in a safe place). It will include the house documents, the bank accounts, all the credit card information, the list of insurances you have. Anything that can be transferred to another person! It seems obvious but it’s tricky. Do you want to include your children, future grandchildren, cousins, parents, friends? It’s a very, very hard decision. My husband and I had a heated discussion! So be prepared! Here comes a tip to save money: in some countries, when you transfer money to spouse, it’s tax free but if you transfer to children, it is not tax free. Make a choice that comforts you and will end up leaving more money in your family’s pocket. If you think your spouse will starve your children then make sure to leave money for them. (it’s a joke!). Check with your accountant or with the tax agency on best money transfer practices. If you decide to leave money for your children, at what age can they use it? 16, 18? 21 or 30? Again it’s a personal decision and depends on the children and the family dynamic. In case you leave money for children and you die before the age you put in number 4, who will manage their inheritance? Will this person be their guardian too? Would you rather have the money held in trust for your kids? A will needs to be executed, meaning someone needs to take charge of gathering your documents and assets and splitting them according to your wishes. These are just a few will preparation tips that will ultimately save money. It’s a difficult thing to think about, but it’s really important, especially if you have children. Even if you think you don’t have much of an estate to leave behind, it’s still important to have a will. I would hate for my family to struggle when I’m gone. Yes, I’d be gone and not have anything to worry about but while I’m alive, I like knowing that my family will be ok.
we did one for our family a couple of years ago. So glad it’s done we made copies for everyone and mailed it to them. Really nice tips!! We did a will as soon as we had kids. You have to make sure everything is taken care of.. This is something my husband and I are always thinking we need to do but just haven’t done yet. This is a fantastic post and I love the tips you included. Very few people actually take the time to do this, and it does save time and headaches! I need to make a living will so that I know that my kids are taken care of if something were to happen to me.